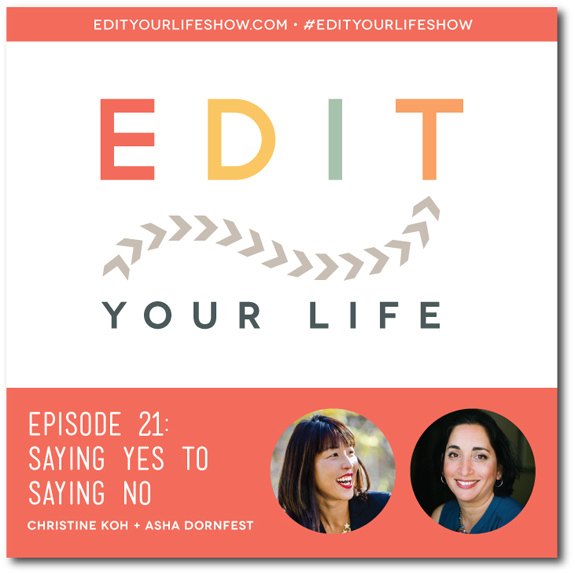 Inspired by a Fast Company article offering the perspective that being overextended is a choice, in Episode 21 of Edit Your Life, Asha and I share 9 tips to help you master the fine art of SAYING NO. Because while there are some things in life that are essential, a lot of things truly are optional. It’s your life, your choices -- we all have the power to identify the things that are important to us, and to make room for those things, in whatever ways we can. If you're not seeing the Soundcloud player, you can listen to Episode 21 directly on Soundcloud. Tell us how you have said no via your favorite social profile with the hashtag #EditYourLifeShow and let us give you a fist bump, or possibly a unicorn. You can also find us on the Edit Your Life Facebook page, or e-mail us at edityourlifeshow@gmail.com. If you found our show helpful, we’d be so grateful if you’d leave a review on iTunes!